While Full Metal Panic! hasn't received an animated adaptation in some time, it continues to press on in the realm of manga and light novels. The most recent sequel, Full Metal Panic! Another, picks up the story about twelve years after the original with a similar setup. A high school student named Tatsuya Ichinose gets involved with a private military corporation called DOMS (Dana O' Shee Military Service) and is suddenly swept up in a world where far too many people have access to giant robots called Arm Slaves. Along the way Tatsuya is threatened by a mysterious group including a young girl named Kikuno Sanjo who attacks him with her customized Rk-02 Scepter. Kikuno Sanjo and her Scepter as they appeared on the cover of the fourth Full Metal Panic! Another light novel. Lately Bandai has been cranking out Robot Damashii figures based on Another with Kikuno's personal Arm Slave also getting the toy treatment. Additional pictures for this review were provided by fellow CollectionDX member, Recognizer. 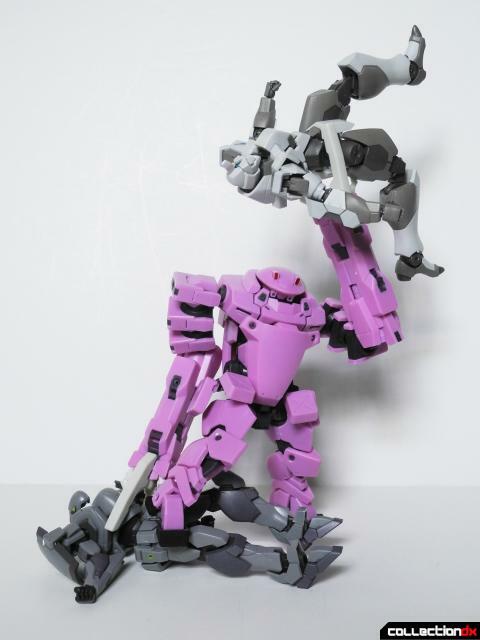 This lilac colored custom machine stands roughly five and a half inches tall and is an all plastic figure. The Rk-02 Scepter is a cool frogman style Arm Slave that hails from Russia and is generally used as an antagonist in the story. The frog motif extends to its utilitarian head design. Its twin red sensors are quite evocative of our pond dwelling friends. The head itself sits atop a double ball-jointed neck and can move around well enough between the high collar. The Scepter is a direct descendant of the more familiar Rk-92 Savage. Both possess a similar bipedal amphibian style build, with the Scepter having a more intricate design that in many ways affords it a greater range of motion. 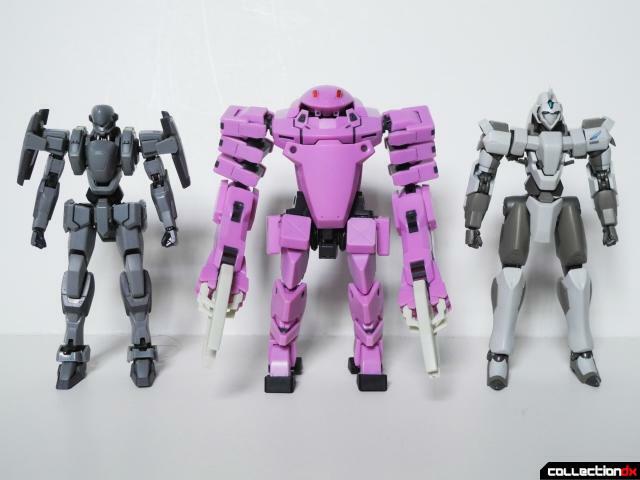 Here is the Scepter with other Full Metal Panic Robot! Damashii figures. 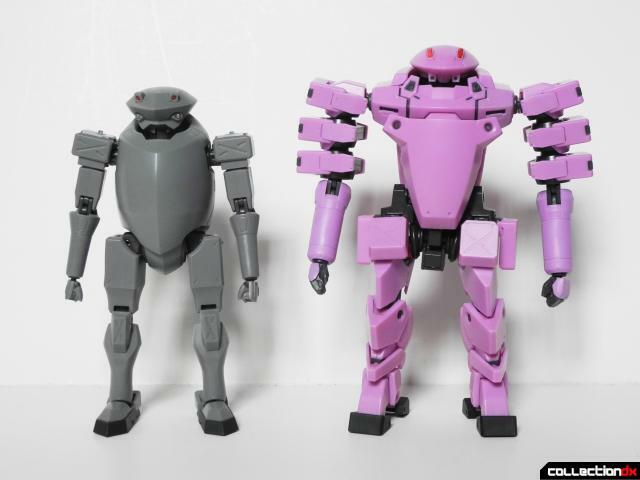 On left is the M9 Gernsback and on the right is a Zy-99 Shadow. You can tell the Scepter is a bad guy by its more monstrous appearance. The Scepter has an amazing amount of articulation hidden within its bulky form. In addition to a traditional set of arm joints, the bicep is made out of three movable blocks strung together with ball and socket connections. This allows the figure to move its arms in normal way or a cool and somewhat inhuman manner. The shoulders also have a great range of motion as expected with Robot Damashii figures. Its hips can splay out to the site while dual ball-jointed heel and toe joints let the Scepter keep its feet planted on the ground. The articulated front and side skirts are attached to their own movable assembly. Positioning everything out of the way makes an impressive high kick achievable for even this stumpy design. There's of neat engineering inside the knees that allow them to expand as the legs bend. Kneeling down is easy for the Scepter. There's even a waist joint located right where the hips come under the belly plate. The hips have two sets of ball-joints connected to a universal joint for additional movement. Pulling the front and rear body plates out by the top allows them to hinge upward to expand the Scepter's range of motion. The front plate actually clicks when you have pulled it out enough while the rear one slides smoothly outward. With both plates unlocked you can employ the figure's upper chest swivel and additional abdomen joints. You can also attach a Tamashii Stage the back once the rear plate is lifted upward. While the Scepter is heavy on articulation, it is rather light on accessories. You get two Tactical Claws, a pair of Crimson Edge Monomolecular cutters (with sheaths), two arm machine guns, and a set of optional hands. Kikuno's brother Akira has his own tan colored Rk-02 Scepter that was released as a Tamashii Web Exclusive that featured an impressive Gatling gun, shield, and missile launcher load out. A quick note on the hands as you get more than this particular figure needs for what it comes with. The hand type on the right with the large space between its fingers and palm is for holding guns while the two types on the left are for holding melee weapons. 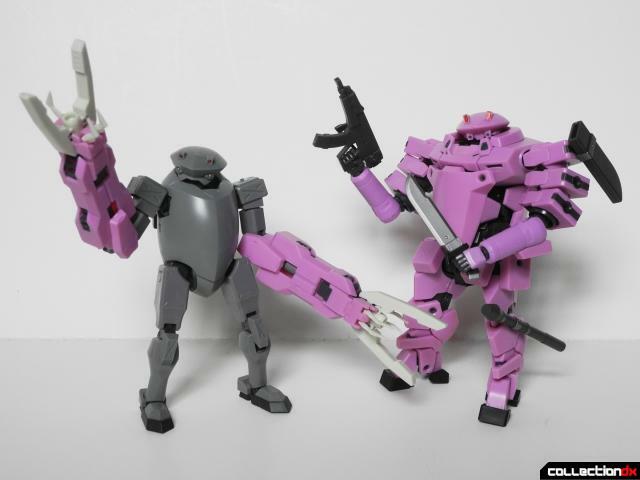 Since the figure only comes with handheld swords, the gun holding hands are provided if you have additional Robot Damashii Arm Slaves as they can all use the same weapons. The Crimson Edge sheaths can be attached to any of the numerous hard points located all over the Scepter's body. They are the small gray circles with a hole in them and are a cool inconspicuous play feature that allows for a lot of flexibility. Just position the sheaths wherever you want to allow the Scepter to draw its blades with ease. The two blade holding hands can hold the wicked weapons at slightly different angles. These look great in the Scepter's hands and help emphasize Kikuno's role as the close combat expert. The Scepter predecessor, the Savage, wasn't too shabby up close either judging by its appearance in the Full Metal Panic! Another manga. After removing the elbow blocks, you can attach a pair of machine guns to the Scepter's arm. These actually stay in place more solidly than the default pieces. The result is a little extra flexible firepower for the Scepter. The Scepter's final set of accessories is a pair of Tactical Claws. Simply remove whatever hands you have attached and slide these over the forearms until they plug into the wrist ball-joint. I found that trying to attach these can knock the elbow blocks off so I removed the elbow parts before attaching the claws and then put them back on after. The Tactical Claws give the Scepter a much more bestial look. Unfortunately their weight is a bit too much for the upper arm joints and all those extra bicep blocks flop around a bit with the claws attached. It will still hold a pose if you position the figure the right way though. The end of each arm attachment has a pair of large movable pincers and two (literally) sharp double claws. The claw package even has additional hard points so the Scepter can attempt to draw one of its Crimson Edge blades with a set of power loader style fingers. As mentioned previously, the Scepter is compatible with weapons from other Bandai Arm Slave figures like the Savage. This allows both figures to borrow weapons from each other for more display options and the hard point system really shines when you have more than one type of figure. On its own, the Scepter with its Tactical Claws still makes for a fearsome looking figure. Arm Slaves are very close in size of the Labors from Patlabor which makes for a fun semi-scale party with Kaiyodo's old Revoltech Ingrams. Just pop the Scepter up on a Tamashii Stage Act 5 and watch out, Ota-san! The riot gun can't stop a heavily armored military machine like the Scepter. Poor Ota's Unit 2 got messed up again! Even my friend Recognizer sees the power of the savage Scepter. Overall the Robot Damashii Rk-02 Scepter is a fun action figure with just enough accessories to make it an enjoyable piece without any other Arm Slaves to bolster its armaments. However if you are a Full Metal Panic! fan and collector, then adding this toy to your Arm Slave squad will let you get even more out of it. I really like how its bulky exterior belies a lot of intricate engineering that enables an impressive range of motion. The Scepter is quite a mechanically intriguing figure that is just fun mess around with. I highly recommend it.